I decided to try the new Vo5 Moisture Soak Elixir after my hair became very dry and unmanageable. The ever-changing British weather often plays havoc with my hair. One day it will be damp and the next baking hot. Add to that my daily styling and it's no wonder my hair decided to have a tantrum! 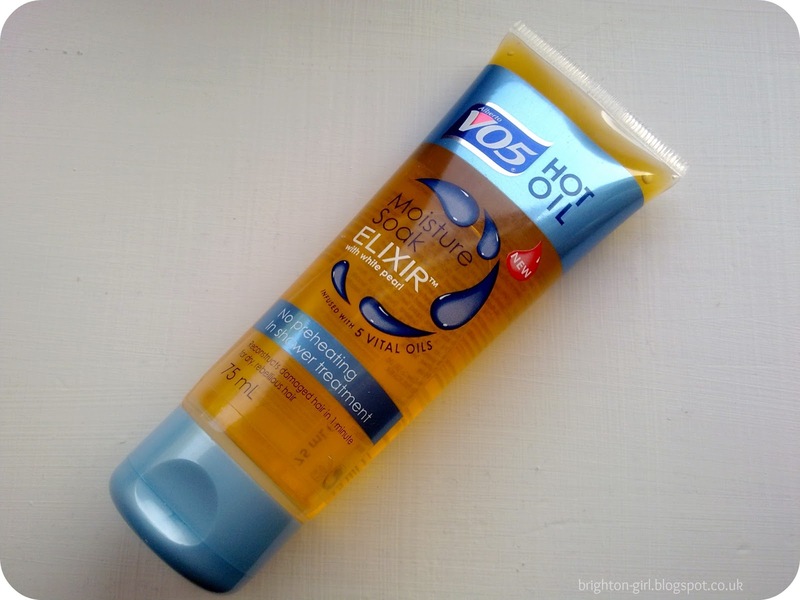 My mum had recommended the Vo5 Hot Oil treatments, but after seeing this on a few blogs, I decided to give it a go instead. I love that there's no faffing with heating this up, making this perfect for when you don't have a lot of time to spare. In the shower you simply apply to wet hair, then after a minute rinse it off, shampoo and dry. There's also a handy guide along the side of the packaging, so that you know how much product to use in each application. After using the Moisture Soak Elixir my hair isn't just back to it's normal self, it's shinier and stronger too! The effects of the treatment are still evident after a few days of using it. The packaging assures me that you can use the product as much as you like without overloading your hair, but I find that this is the perfect weekly treatment for my hair. The only negative point I have with this product is the packaging. The product itself is really rather runny and getting it out of the tube can be a bit messy and I often end up spilling a bit. The Moisture Soak Elixir works so well that I hate to see it being wasted! Quite frankly, I'm amazed at how this has managed to tame my hair! I love that it's so quick and easy to use and that it's so affordable (I picked mine up for £4.29 in Boots). Vo5 Moisture Soak Elixir is definitely going to become a permanent feature in my hair care routine. What products do you use to keep your hair under control?